That’s great, but lots of books get big praise. The value in this book is that it set a new standard in what graphic narrative can do. It’s a quintessential example of the kinds of literary innovation hanging chad celebrates and constantly seeks. The book does what great literature is supposed to do, it creates empathy and deeper understanding and insight into other lives–and our own–from other life experiences. And it shouldn’t go without saying, it’s also entertaining. And that’s just what Fun Home does. It also happens to be super-smart, even–dare I say–intellectual. Bechdel’s father and mother were readers, and Bechdel herself explores meaning and life through the philosophies and poetry of many notable literary champions. Thus, the journey of identity is even more complex than gender roles, stereotypes, and sexuality. It’s a spiritual and psychological identity journey as well. 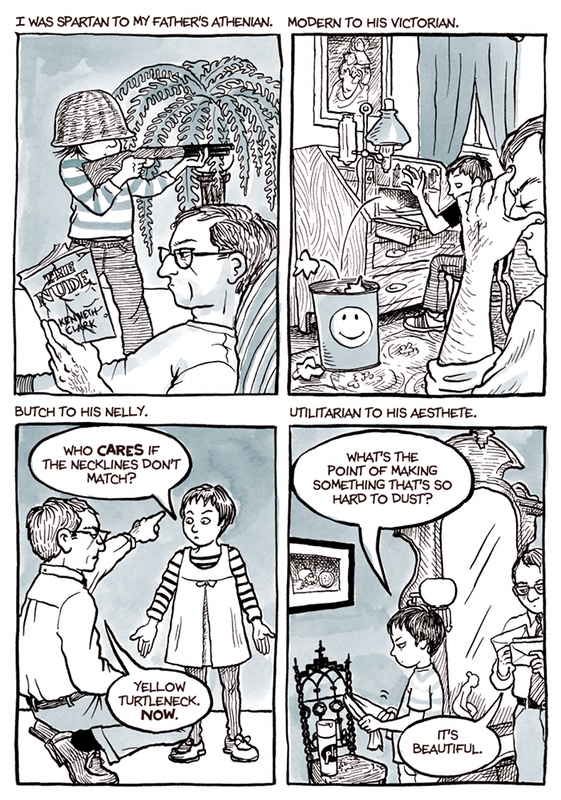 The title’s “fun home” refers to the family funeral parlor where her father worked and is an ironic and pitch-perfect setting for Bechdel’s investigation of loss and grief. Bechdel traces the intertwined threads of her life in relationship to her father, especially as it relates to her homosexuality, her father’s closeted homosexuality and his death. Her site, that she’s developed now for many years is enough to make anyone laugh and cry and want more. And maybe that’s another part of what makes her storytelling so strong. It’s more than the courage it takes to completely reveal one’s past, although that’s part of it. I think an easily overlooked one is the combinatorial dimension of the high and lowbrow working together seamlessly. Here she is reading an excerpt accompanied with the illustrations. Here she is discussing her new memoir, Are You My Mother?